More than 3,000 days have passed since I noticed something was wrong with my mom. At first, I didn’t believe the subtle changes could be dementia-related; after all, she was only in her mid-60s and had recently retired. I thought, “Retirement is a huge adjustment. This will pass. It has to pass.” Besides, Alzheimer’s disease and other dementias affect other people, other families. Not mine. That was in 2004; I was 27 years old. Turns out, dementia can affect anyone, at anytime. Today, my mother Margarita is nearing the end of her journey. She can’t walk or talk. She can’t even feed herself; in fact, she subsists on a liquid diet because she no longer knows how to chew her food. I can’t remember when my mother forgot my name… it’s been a few years. But that’s OK. I have no idea if she knows that I’m her daughter. When I walk into her room, she just stares. Sometimes, she’ll yell out — her only form of communication. When she does yell, I assume it’s her way of saying “hello.” My mom no longer smiles, she can’t hold my hand or give me a kiss on the cheek. Really, my mom just exists, with no real quality of life to speak of. Her type of dementia was a difficult one. Not Alzheimer’s disease, rather its lesser-known cousin: Frontotemporal dementia (FTD or Pick’s disease), a type of dementia that can cause severe behaviors and affect language. Unfortunately, FTD is terribly misunderstood and often misdiagnosed. 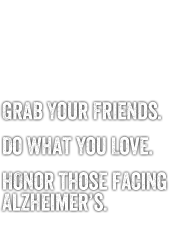 I joined the Alzheimer’s Association in 2007 when I found a support group in New York City for young adult caregivers. At the time, we were told my mom had Alzheimer’s disease. I was in a tailspin, so I sought support. In 2009, after moving home to Phoenix to help with my mom’s care, I found another group, YAAA! or the Young Advocates for the Alzheimer’s Association. Although I would learn a year later that my mom’s dementia was likely FTD, I remained committed to the Alzheimer’s Association because I believe that if we #ENDALZ, we will #ENDFTD. That’s why I am walking in The Longest Day, a 16-hour event to raise funds and awareness for Alzheimer’s support, care and research. Today, we’re walking along the South Rim of the Grand Canyon. It’s a beautiful sight to behold, and a humbling one, too. After last year’s inaugural event, I was determined to participate this year because it was that impactful. I knew that what I was doing would make a difference. But I can’t do this alone. I need your support because the numbers are not on our side. Alzheimer’s disease is the sixth leading cause of death, and the only cause of death among the top 10 in America without a way to prevent it, cure it or even slow its progression. Something is very wrong with that. And that’s why your donations are critical. Think about this: for every dollar you give, we’re one step closer to sparing another family the gut-wrenching agony of watching their loved one decline in such a grotesque way. This disease doesn’t just take out the individual; it can wipe out an entire family. Our team this year might be small, but we’re certainly mighty. We’ve already surpassed our fundraising goal of $1,600, and together, we’ve raised more than $2,800. The Longest Day is a tremendous event not only because it’s an opportunity to honor our loved ones, but it has the potential to be a real game-changer in the fight against Alzheimer’s and other dementias. So, today I’m walking, along with my incredibly supportive partner Jon (who beat me this year in his fundraising efforts – BRAVO! ), both in honor of my lovely mother, whose beautiful smile I miss so much, and in honor of the many individuals I have met along the way who are living with this awful disease… I’m walking for Mary, for James and for Jim. Our journey has been long and incredibly difficult at times with more pitfalls than I care to mention. There have been sleepless nights, hours of fretting and buckets of tears shed. But I am my mother’s advocate and it’s a responsibility I take very seriously. That’s why I am walking on the longest day of the year. Kathy Ritchie is a Young Advocate for the Alzheimer’s Association and a writer. She has chronicled her journey with her mother on her blog, My Demented Mom. You can learn more about Kathy, her mother and Frontotemporal Dementia at www.mydementedmom.com or follow her on Twitter @mydementedmom. What a beautiful story. My husband of 39 years passed away on May 31 of Lewy Body Dementia, he was diagnosed in the spring of 2009, but began showing signs in 2006. In the middle of his last 6 weeks, we/he had a good 10 days, where he was able to talk, walk, feed himself, and take care of his personal needs. We saw those 10 days as a blessed gift. Last October our two adult children and grandchildren participated in the Walk to End Alzheimer's; little did we know it would be the first and last Alz. Walk that my husband would be doing with us. We too are committed to finding a cure for this horrific disease. Your mother and your family are in my prayers. Stay strong.